I spent some time today looking around at some of the blogs I follow and ran across the current CAS(E) this Sketch challenge. I thought it would be fun to play along since it's been awhile. I looked back and the challenge I joined (other than my design team stuff) was back in December! Holy cow, it's been busy and time has flown by. Thanks so much for stopping by and have a great day!!! 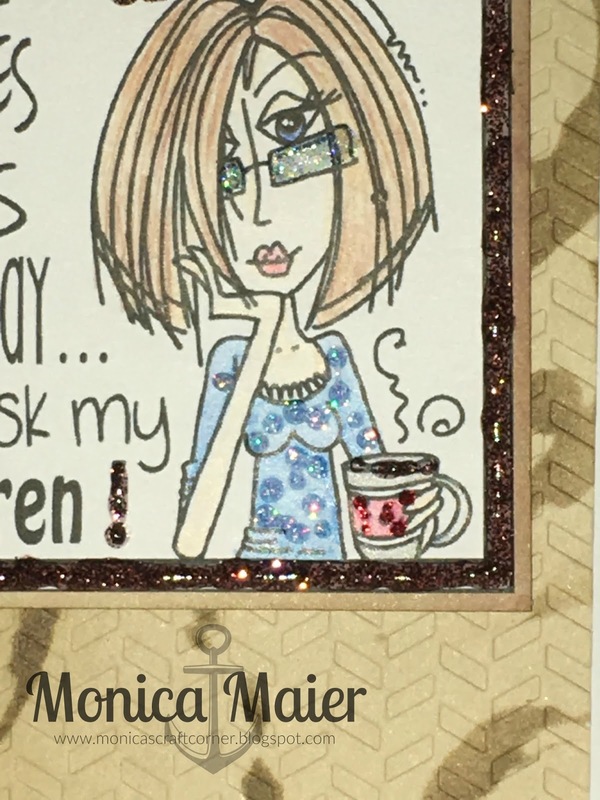 Today I'm sharing the last card for the Diva's make it glitter challenge this month. I just want to say thanks to our wonderful sponsors Bugaboo stamps and Dies R Us. I decided to use Lawn Fawn products that can found at DieRUs to say thanks! 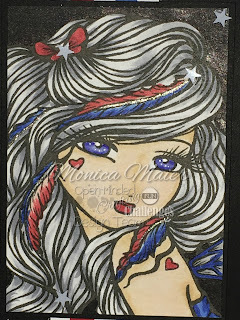 I used an old wink of stella that I've refilled with water to water color my stamped images with distress markers. I stamped an extra flower on a separate sheet of watercolor paper to color and die cut. Adhered my watercolor panel and pattern paper to my card base, before adding my die cut sunflower. 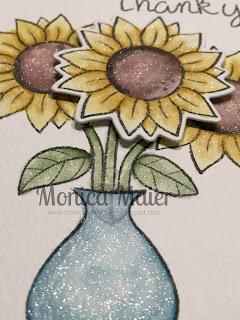 Here is a closer look at my popped up flower and the shimmery watercolor! Just love all the shimmer! 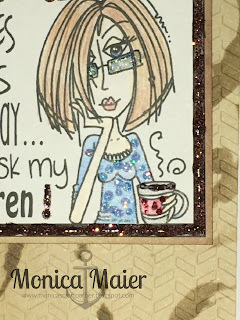 Here is a quick little peak of my card today for the A2Z Scrapbooking store blog. To see the full card and info visit the blog here. Hello everyone, here is a card for the Die Cut Diva's blog our theme is make it glitter. I just added a hint of it in a few places. 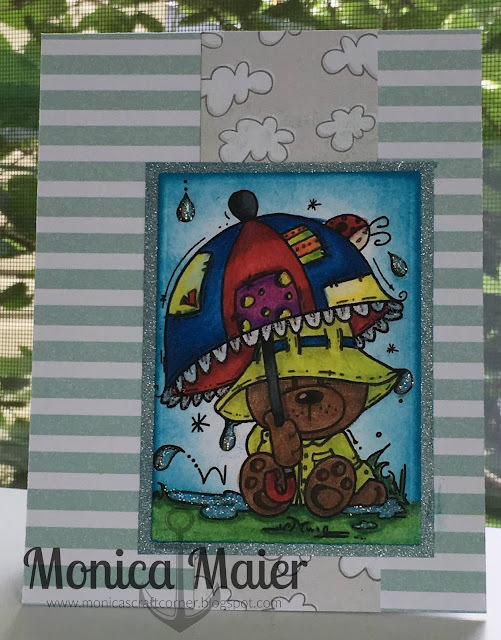 I colored my image with colored pencils, die cut the image from cardstock and layered with some glitter paper that I used distress ink on for color. I layered all my pieces on the card. 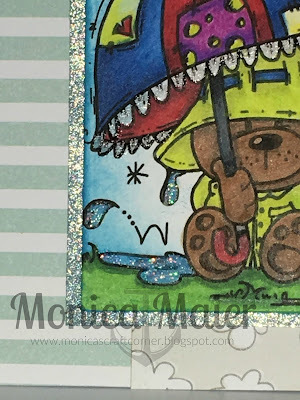 I added stickles to the rain and to the trim on the umbrella. Just a little peak at a part of my card for a2z Scrapbooking. 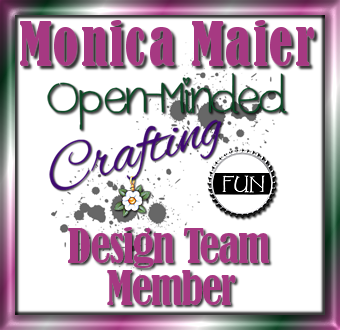 Hello all I'm sharing a card I made for Open Minded Crafting fun. For our June challenge we are to use our countries colors. I used the Monica digi image from Crafts and Me. I couldn't help but pick her, she has my name after all!!! I loved the feathers in her hair and new I wanted to color them in red and blue. I added some silver glitter pen to add some sparkle to the feathers stem. 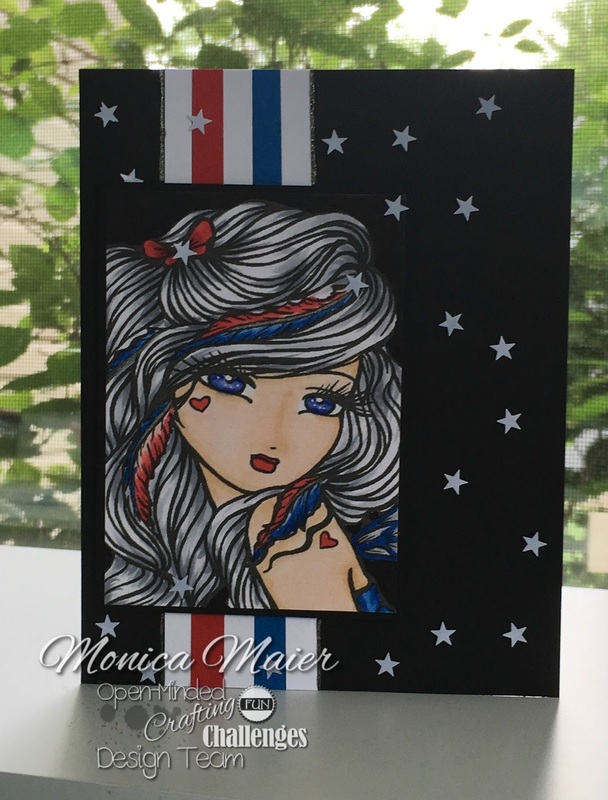 I added my panel to black cardbase to help the patriotic colors pop more. To finish the card I added some star sequins in random places. Here is a closer look, where you can see the sparkle a little better. Thanks so much for stopping by. Be sure to stop by the challenge blog and play along for your chance to win a prize. 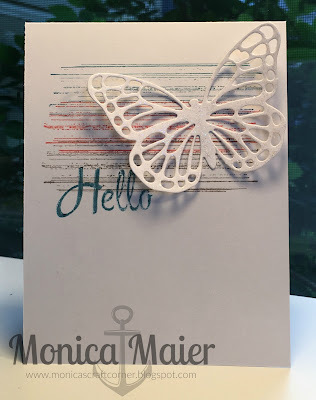 Today I'm poppin' up with a post for the Die Cut Diva's! Our June challenge is " make it glittery" and we have two wonderful sponsors, Bugaboo Stamps and Dies R Us. 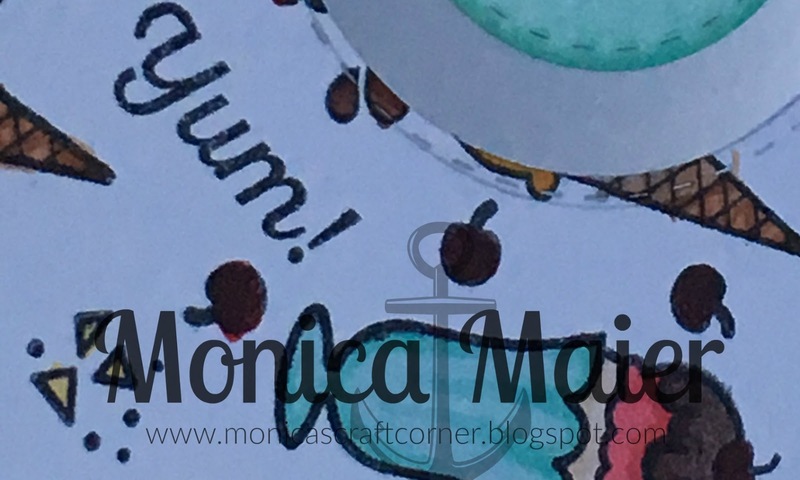 Hope you pop over to the blog and join us for this months challenge! After printing this JJ Coffee image from Bugaboo I colored here in with colored pencils and trimmed her out. 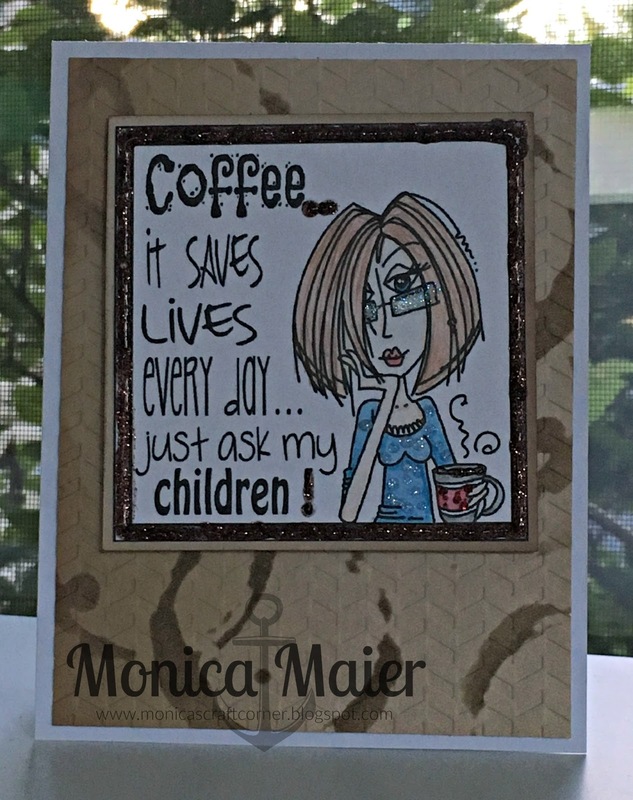 I used some Ground Coffee distress ink and the splatters stencil from Tim Holtz, then embossed the panel. I adhered the panel to a white cardbase. 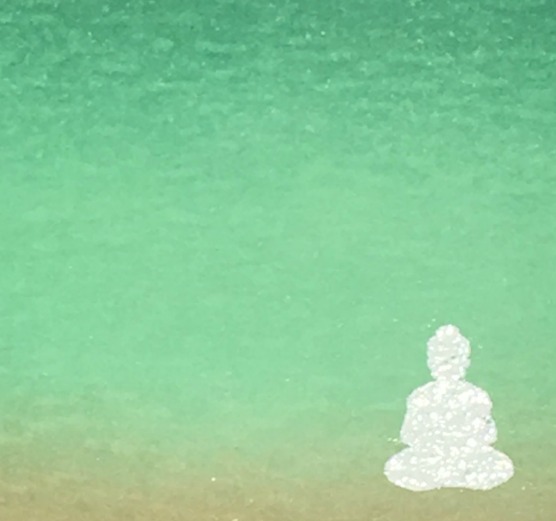 I used some foam adhesive to attach my image panel and once it was attached I went to town adding glitter glue!!! I smooshed some clear ink on a sheet of paper and used some gold perfect pearls to color it before running it through the Cuttlebug to die cut the numbers. I used the same perfect pearls over the leafy images stamped on the the decorative strip. I used some glitter washi tape to border the strip on the card. Stamped the sentiment under the washi. 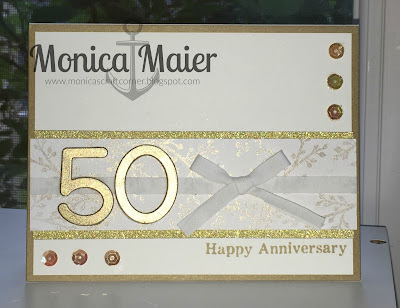 Before adding the panel to the card I added some ribbon, then adhered all my embellishments. 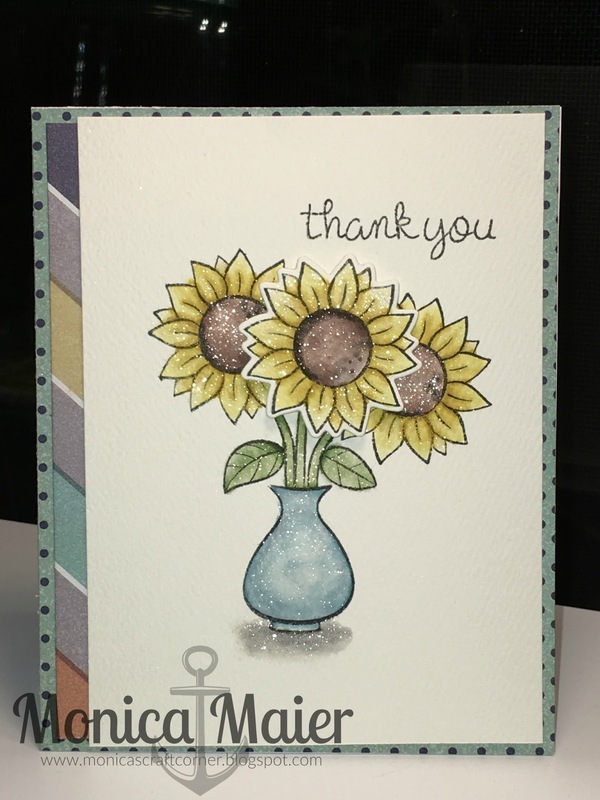 Thanks for stopping by and don't forget to visit a2z Scrapbooking blog! Have a great day!! !